Our first upgrade of 2013, with so much more to come! Over the weekend we completed our first 2013 upgrade, following on from the second upgrade to Samurai back in December of last year. Such is the elegance of the Software as-a-Service model, each and every one of you can benefit from the upgrade when you next log in. The ability to drag and drop questions, sections and even entire questionnaires so you can re-order with consummate ease. Improved logic for weighted RFQs and Auctions when questionnaires have not been submitted, have not been scored or are awaiting resubmission. Ability to manually re-send event invitations quickly to all who have not responded. Enhanced document management functionality depending on which stage of the event you are in. A new questionnaire question type for requesting a document to be uploaded, which can then be scored. Full integration between our CRM and Market Dojo and so when you next call up, we’ll know who you are! And most importantly, updating our copyright text at the bottom of the site to read 2013 instead of 2012! On top of this, we have made a number of upgrades to our infrastructure to keep ahead of the increasing demands of our customers. We are now sending several thousand e-mails a day, practically becoming a MailChimp in our own right, and so we have upgraded our e-mail account to ensure uninterrupted communications between our Hosts and their respective participants. We have also upgraded our servers (again) to ensure we maintain our 99.9% uptime record. Some events have even had over 500 participants involved, and so we’ve learned a great deal about where potential bottlenecks may lie and catered for them accordingly. We have a number of exciting new features we are working on that will be released imminently. For example, in collaboration with our customer Arqiva, we are in the final steps of testing and improving our User Hierarchy feature. This will allow our users to invite friends, colleagues and countrymen to view their sourcing activities, or even to have edit rights should they have a licence. You can manage all your internal users from a central place, see all the events across your organisation from your own Dashboard, and even invite external users such as consultants to have their input on your activities. We are also nearing completing of an enhanced white labelling feature with another collaborative partner in the US as we help them with an exciting new venture. 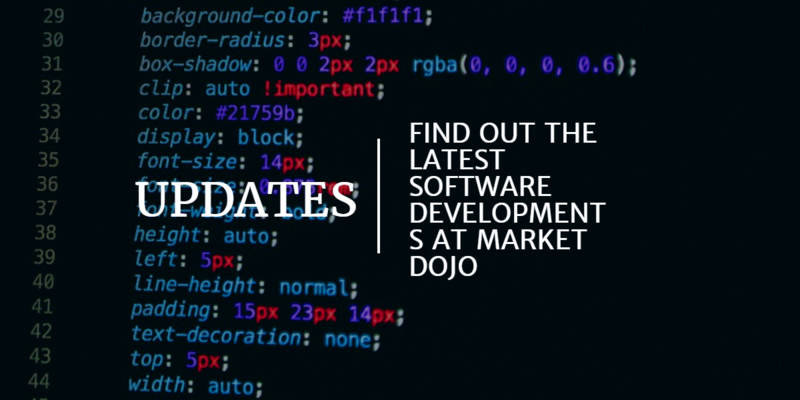 Our users will be able to define their own URL for the sourcing events, such as www.esourcing.marketdojo.com, which will have your logo and menu colours with your own log in, sign up and password reset facilities. In short, it will be your own portal: even the e-mails will come from you. Here’s to a fantastic February ahead! PS: If there is anything you’d like us to work on, get in touch and we’d be happy to talk.